We are all "manufactured" the same way and with the exact same parts down to our very cells. But our genealogical heritage -lifestyle -diet -line begins the highly influential process that affect our wellness potential more than we care to think. While what and how we choose to eat once we realize that we have been on the wrong diet will elevate our potential more than we ever thought possible, it can not guarantee the highest health and performance life potential. That endowment is due to factors way before we were even born. Or even conceived. It is a fact that about 95% of your health potential is determined before age five, much like your basic personality. If, for example you were not breast fed at the appropriate time, then you will not develop the basic structures of your brain, body and cells as well as they could have. Colostrom or any of the other important factors in mother's milk can not be given with any results to be expected to a child after a certain age any more than millions of dollars can be deposited into a bank when the computer is down or it is closed. That does not mean that we can not make the best of what we have. History and science prove that identical twins can have two distinctly different life outcomes and health throughout by way of their diet, even though they are of the exact same cellular material. But remember that for either of them to reach their full potential is determined by factors beyond their control. Genes are not set in stone; heredity is nothing more than stored genetics, as stated eloquently by Luther Burbank, a master geneticist. We tend to lump genetics and lifestyle into he same heap, when one is controllable over a much slower time frame and the other is rather immediate in its power. When you eliminate the obstacles in your controllable life you can make super strides ahead in your wellness and performance as is evident for anyone who has sincerely done it. By keeping the "ball rolling" so to speak you will also make giant leaps ahead in your heritage line. Children born to 100% raw vegan parents who were eating proper raw vegan diets for many years, and who were way beyond the "cleansing" or transitional phase are rewarded with super little boys and girls. Of course they breast feed them. Now, if those children choose to continue eating right, and they choose to have children, but they do not breast feed, then that will be a major "setback" that can not be retrieved no matter how the new breed chooses to eat and live. The two major factors- lifestyle and diet, are usually nor interpreted correctly. Most people are led to believe that genes cannot be changed. Or that diet has no impact. nothing could be further from the truth. Keep in mind however that day to day diet habits add up in a huge way- in a genetic heritage way. In the last decade it has been clearly shown yet agin that in as little as eight weeks a man can virtually eliminate 95% of his "bad" prostate gene indicators, for example. We all know that those who eat a plant-based high raw diet live longer and suffer much less from disease than their animal product eating counterparts. But without proper "health-lineage" (diet habits that came before us, PLUS our parents- and their parents- taking care to breast feed us for at least the first six weeks, and better yet for 12 to 18 months or longer), we can suffer major setbacks compared to whose who were breastfed. 95% of our health is determined by what we eat as young children for the first five years. That on top of being breastfed to begin with. We humans are quite a tough organism, but our chances go up or down due to two main factors: pre-birth lifestyle and diet lifestyle. 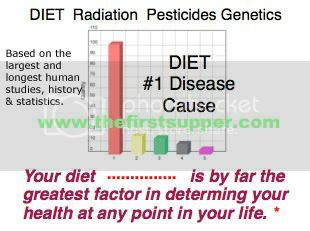 While most know that the five major causes of cancer are food, radiation, pesticides and genetics, few know that food is by far the biggest influence and that genetics has only about a one percent "pull" if that. Many people that I come into contact with at the grocery store seem to think that cancer, diabetes, and even heart disease and high cholesterol are beyond their control. They must have misunderstood their doctors or they watch and actually believe the TV pharma. No doctor would ever tell a patient that the drugs not only hardly make a dent, but that they cause even more damage than the "disease" itself. But most of us who are seeking solutions are easily swept away by smoke, mirrors and empty promises. Blessed are those lucky enough to stumble upon the truth, and who actually pursue it. The bottom line: Be thankful if you come from "good stock"- and that your lineage of diet and lifestyle habits was a judicious one. But even if not, you can still make incredible improvements in your state of everyday physical health, freedom from chronic disease, plus physical performance just by eliminating all of the health-destroying foods that have crept into our lives and going back to what the best genetic lineages are built on: fresh, raw, whole plant foods, eaten the best way. For information on how to eat raw the best way so that you can actually benefit without cravings, take advantage of our special Raw Coaching Program, starting July 12. Discover what a combined 24 years of being 100% raw can do for you. Avoid every single pitfall and eliminate all the guesswork. Know what to expect, and never feel alone. Most importantly, never fall back into prior habits. Our raw team is headed by myself, PFS, ASNDC, eleven-year 100% raw foodist and physical fitness specialist. I have mastered the pitfalls and labyrinth-like path of going totally raw, and with a background of poor genetics and thirty years of non-supplement and non-steroid physical transformation from 133 lb. at 6 ft. tall to 210 lb. at the same height while reducing my waist almost an inch in that process, as well as suffering from "anti-exercise leverages" and less-than-perfect lower back and overall strength and fitness to begin with, and who suffered a debilitating auto collision in 1998 among other set-backs, I have been told by my beloved clients and students who, themselves have learned how to transform under my humble guidance, that I know a little bit about how to go about this. For information on this special additional program, send me an email here.